When a couple gets divorced, the issues and assets on their mind include who gets custody of the kids, what to do with the house, what to do with the joint bank accounts and savings accounts, etc. The thought of your online accounts and social media profiles is probably an afterthought. But protecting your online profiles and accounts is extremely important. Why? Because various social media platforms like Facebook, Twitter, SnapChat, etc. make it all too easy for a disgruntled soon-to-be-ex-spouse to retrieve information that could be used against you. For example, your spouse might do a deep dive on your social media profiles to try and locate photos of you out with friends and potential new partners, or they may try to locate a status update that could be considered offensive or crude. They could then turn this information over to their lawyer to be used in court or during mediation. This is why it is so important to set all of your social media profiles to the highest privacy settings possible. It’s also important to be very cautious if someone you do not know suddenly friends you on Facebook or starts following your Twitter account. If your spouse knows the user name and password to your Gmail account, Outlook account, and other online accounts, that will present a privacy issue. This is why you should immediately update all your passwords, consider implementing a two-step authentication process, and update the security questions when someone attempts to log in to an account. If you have updated your passwords and enhanced your privacy settings, but are still concerned about your spouse, or their legal team, gaining access to your accounts, you have the option of starting fresh. You can deactivate an account and open a new one on most social media platforms. 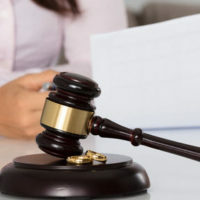 A Standing Order is essentially a temporary restraining order that prohibits both spouses from taking specified actions when the petition for divorce is filed in court. In Texas, more than seventy-five counties use a Standing Order rather than a standard temporary restraining order. The Standing Order in each county will likely have slight differences you need to be aware of and comply with. This is why it is so critical to have experienced counsel on your side that understands what legal documents need to be filed and followed during the divorce process. The Houston divorce lawyers with Lindamood & Robinson, P.C. are here to help you through this tough and stressful time. Our team of lawyers possesses decades of experience representing people in complex divorce cases. We know that there are many ways people are able to acquire electronic information nowadays. We will work aggressively to protect your accounts and your good name. Contact our office today to schedule a confidential meeting where we can discuss the best way to move forward.